The early seventies brought any number of memorable rock album sleeves, as the psychedelic covers of the sixties to a large extent gave way to a more direct designs approach. 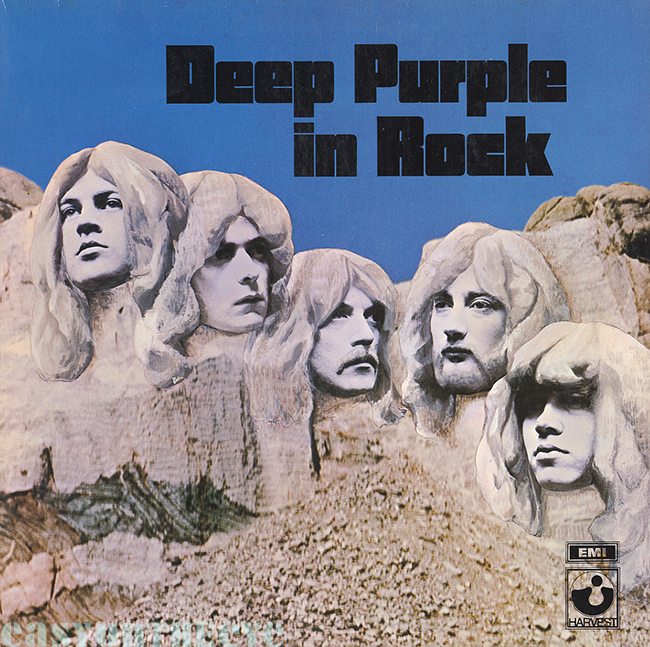 Arguably the founding trio of hard rock band of that time, Led Zeppelin, Black Sabbath and Deep Purple, all released albums close to each other whose sleeves are familiar to generations of music fans. 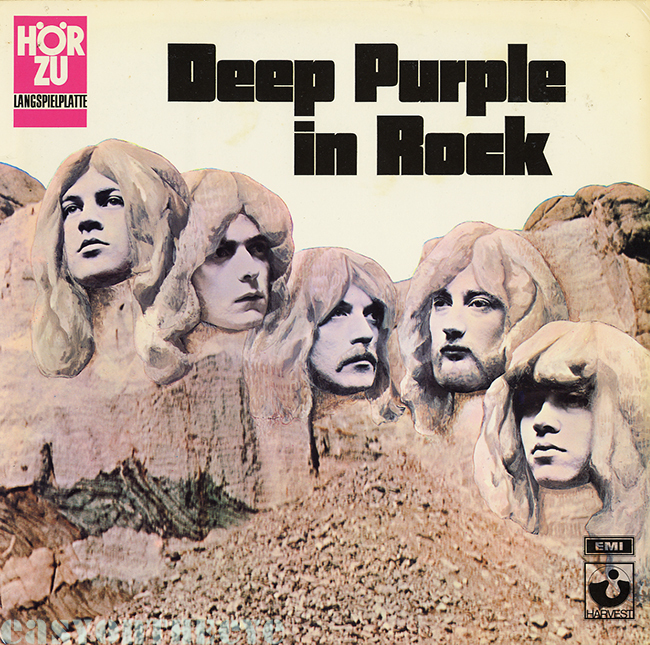 Alongside Led Zeppelin 2 and Paranoid, Deep Purple’s contribution was the impressive In Rock album, which came in a sleeve based on a very simple idea from their manager Tony Edwards; to replicate the famous Mount Rushmore Presidential monument in America but substitute the heads of the band. Most musicians have a mixed relationship with their manager, but Edwards was very hands on in the early days and having run his idea past the band, went off in search of reference material himself amongst the Fleet Street photographic agencies. It’s easy to forget that sourcing photographs back then was a case of working through the archives of one of the many long standing London picture libraries. London design agency Nesbit, Phipps & Froome prepared the artwork. 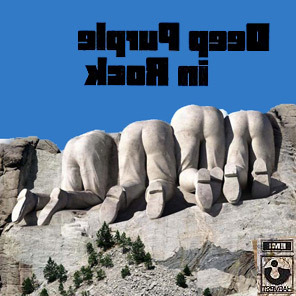 They took pictures of the band, cut out and stuck them onto a blow-up of the Mount Rushmore photo, making a less than successful attempt to paint over the joins and blend the images together (there were no digital retouching tools available then). 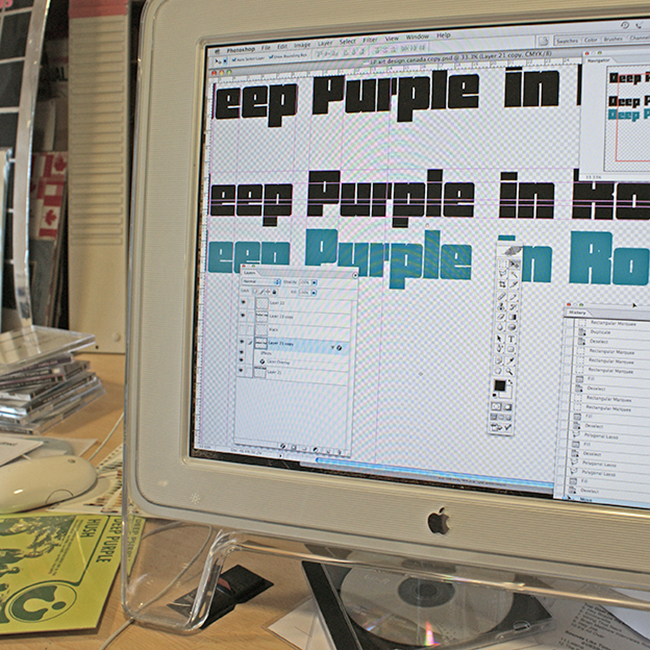 The title lettering was pro­duced by hand at the agency. Unable to find a suitably heavy looking typeface they simply invented one. This was not unusual; much album titling was still done by hand as the available type designs then were mostly traditional and designers were keen to come up with something more modern. Both the Led Zeppelin and Black Sabbath sleeves of the time (Zeppelin 2 and Paranoid) did the same. For In Rock they used a basic rounded square shape and cut into this the various elements of each letter. Rather than add a fake cloud background, they just specified a pale blue fill and the job was done. 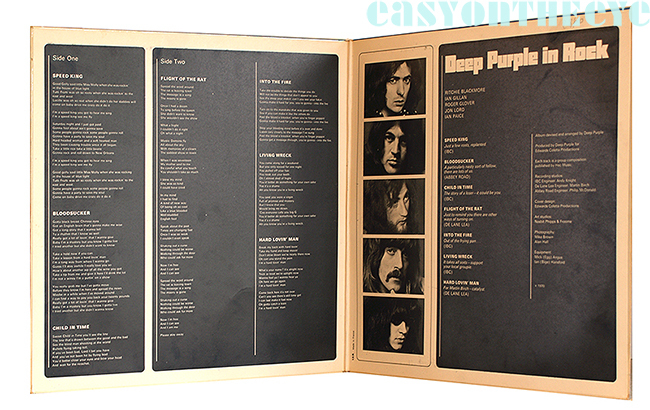 The inside gatefold was very simple, largely white text on black with lyrics, moody black and white photographs of the band members and production credits. EMI used Garrod & Lofthouse, one of the two biggest British record sleeve print companies of the time, to produce the sleeve which, in the style of the time was laminated outside but not inside (Zepp 2 was not laminated). Unusually the front cover design was simply repeated on the back. Released via Harvest in a gatefold, a trademark feature of the label, they probably just ran out of time to do a special back. Despite that, overall the final sleeve looked the business and still does so today. The grey / blue image both captured the essence of the band’s ultra hard music, and stood out in the racks. Released in June 1970, the album quickly charted and would remain in the British top 30 for over a year. The vinyl was only deleted in the 1990s as the CD format took over (and it has since been reissued on vinyl twice). It’s an important cover which belongs in any representative collection. Needless to say there were many minor variations of the cover over those 25 years, perhaps the oddest of which was a German edition which deliberately dropped the blue sky. And the Mac screen shot above? A few years ago I was involved in a reissue of the album and having scanned the lettering in, decided to redo this digitally so we could generate extra letters for an accompanying single! Nesbit, Phipps & Froome would go on to do two more sleeves for the group; the studio album Burn in 1974 and their first proper compilation 24 Carat Purple in 1975. Curiously I can find no other sleeves (by any band) credited to the agency. UPDATE – I have been contacted by the son of the designer who put the art together, and hope to have more information on the project shortly. Thanks to Easy On The Eye for information, some of which comes from the book Wait For The Ricochet, about the group and their career during the making and touring of the album. More details at Easy On The Eye books. UPDATE – Rasmus Heide has suggested we include the never used back cover image for the sake of completeness. Happy to oblige! The Burn cover is just as great as In Rock! It deserves recognition too! I hope to cover this in the future once the designer has been back in touch. Disagree, I never cared for the cover art for Burn..the candles don’t look much like the band…looks messy.